An Elegant Golf Wedge in Pewter mounted on a Rosewood Finish Base. 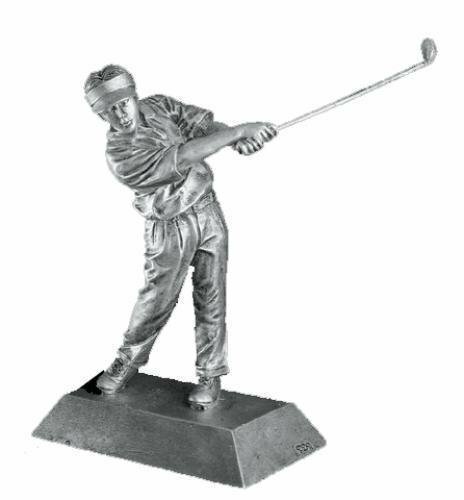 A Hole-In-One Award with Offset Tee designed to fit a Regulation Hole-In-One Golf Ball mounted on Rosewood Finish Base. Lots of action is packed into these Legend Golf Awards. 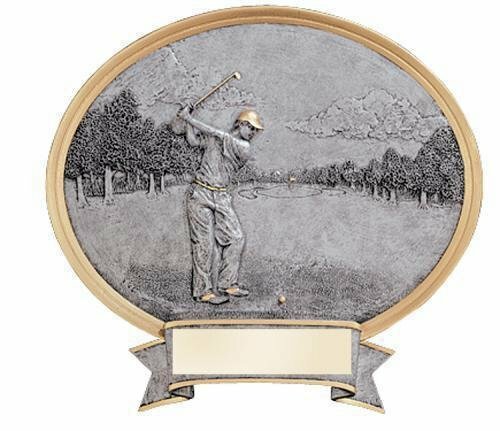 The player and some of the background elements in the award are raised providing a 3-dimensional look. A golfer positioned to address the ball while a beautiful tree lined fairway complete the scene. These oval awards are available in male or female versions along with your choice of two sizes, 6 1/2" X 6" and 8 1/2" X 8". This item can either be hung on a wall or placed on a desk using the included stand. Action Swoosh Pewter and Gold Golf, Female Figure with Full Color Sport Icon on Black Finish Base. 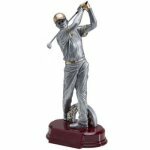 Action Swoosh Pewter and Gold Golf, Male Figure with Full Color Sport Icon on Black Finish Base. Stylish design along with lots of detail makes these Signature Series Golf Awards a great choice. The creases in the pants and shirts along with a fully extended club make these golfers appear to have just hit the ball. 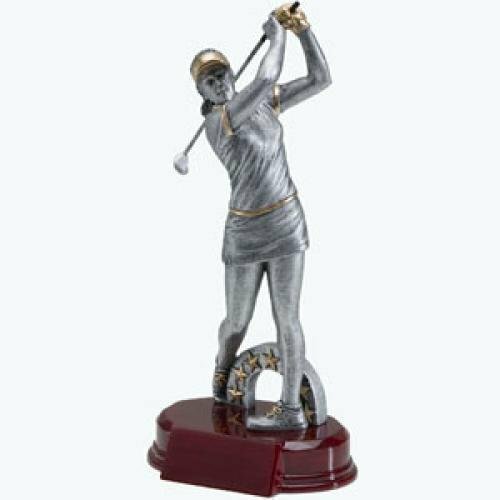 Great flexibility is provided with these awards as they are available in male and female versions, a choice of gold or pewter finish, as well as two heights 8" and 10". Any golfer would proud to receive and show off these awards.